Leather Zip Calculator Folder Made of genuine leather. Multiple interior pockets, Calculator included, Pen sleeve, Zip closure. Due to the imperfections of leather debossing imprint may vary. 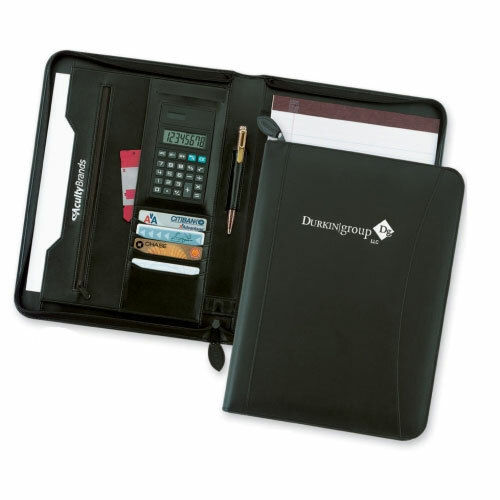 The Chief Financial Organizer portfolio is a promotional gift that is sure to add up for your brand!Measuring 10" x 13 1/2", this handy folder is designed with French turned edges and precision stitching for a sleek, elegant style. It features a zippered closure, a solar-powered calculator, a front cover pocket, a pen loop, a writing pad (8 1/2" x 11"), a large gusseted pocket, a zippered pocket and four card pockets. Customize with an imprint of your brand logo for increased exposure on a useful product for students and professionals alike. Make a calculated decision today! Bulk / 24 lbs lbs / 12 pcs. 5 - 7 Business Days *Production time begins after artwork approval and does not include shipping time.